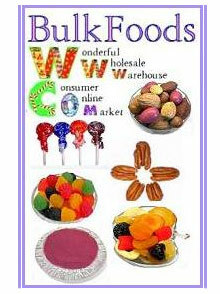 The foods you want in quantity at great prices the wonderful wholesale warehouse and consumer online market of BulkFoods.com is only a click away. Natural health foods - Keep your family healthy with vegetarian protein sources like texturized soy protein and nutritious soy protein powder. Use them as part of a vegetarian or vegan diet, or as healthy additions to meat-based meals. Or choose natural peanut butter, dried vegetables, and herbal teas to stock your healthy pantry. Organic food shop - Enjoy organically grown foods for less when you buy Amaranth, couscous, wheat berries and quinoa grain online from Bulk Food's organic food shop. Or select organic fruits, nuts, sugars and basmati rice. Organic doesn't have to mean expensive when you buy in bulk. Grains and flours - Buy grain online and save with Bulk Food's great selection of whole and milled grains and flours. Add the flavors of barley, oats, millet, spelt and Quinoa to your diet. Choose corn, couscous, buckwheat, wild rice or bulgar for your pantry or food storage. Don't forget yeast, powdered milk, baking soda and other essential baking ingredients when you order your flours and grains - Bulk Foods has it all. Bulk candy and melting chocolate - Satisfy your sweet tooth with Merckens chocolate and other delicious treats from their online candy store. Make your own rich Merckens candy covered snacks and other confections with their melting chocolate and candy coating wafers. Herbs and spices - No gourmet kitchen is complete without a selection of fresh herbs and spices. From turmeric to rosemary, they have the spices and herbs you need for all your favorite recipes. And when you're using online food ordering to add to your food storage, remember to include the appropriate seasonings with each order of grains, rice, soup bases and dried vegetables. From organic and natural health foods to bulk candy, online food ordering is less expensive thanks to the good folks at Bulk Foods. They're your number one online supplier of spices, grains, nuts, snack mixes, baking and cooking supplies as well as candy, gifts, chocolates and more. Sugar free confections are available too. Search their on -line directory of over 3,000 items. Their foods are the highest quality and fully guaranteed, plus they provide fast, $5.00 Flat Rate Shipping on orders over $75.00!